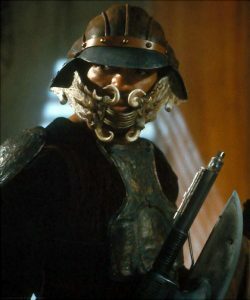 Growing up as a boy, I remember one of my favorite action sequences from “Star Wars: Return of the Jedi” was the Han Solo rescue on Jabba’s skiffs over the Sarlacc pit. 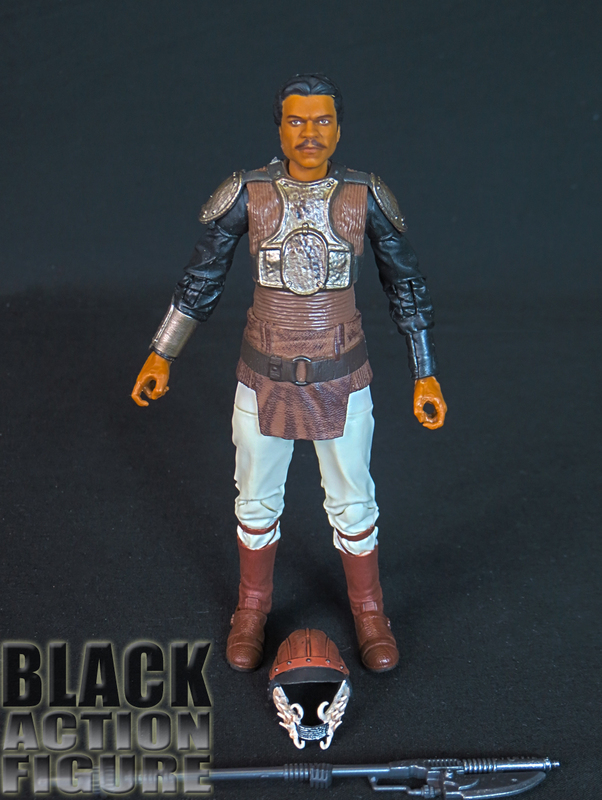 I remember Luke looking over at Lando with a nod like “you ready?” and then Lando returning his nod like “I got you.” I recreated that scene over and over again with my Star Wars figures as a boy, almost recreating the whole scene…except in my re-imagining, Lando took out all of the Skiff Guards, Boba Fett, saved Han, killed Jabba, and swung over with a half-naked Leia at his side. I mean, it happened like that in the movie, right? I was surprised…and maybe a little ecstatic…that Hasbro announced Lando Calrissian in Skiff Guard disguise, allowing me to do the same thing all over again, but this time in 6″ form. 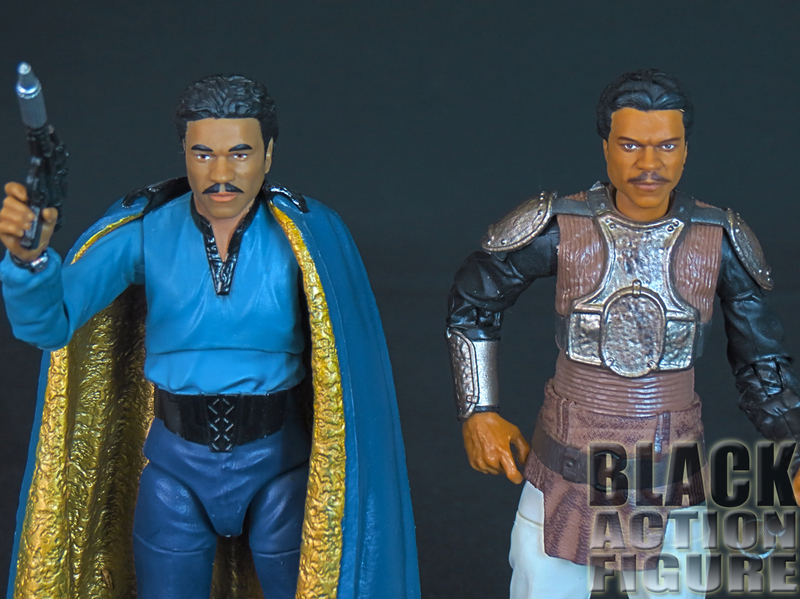 And this time, maybe Lando will get to save Leia, a couple of the bar singers, and a six-pack of Colt 45 from the bar while he’s at it….fun times. 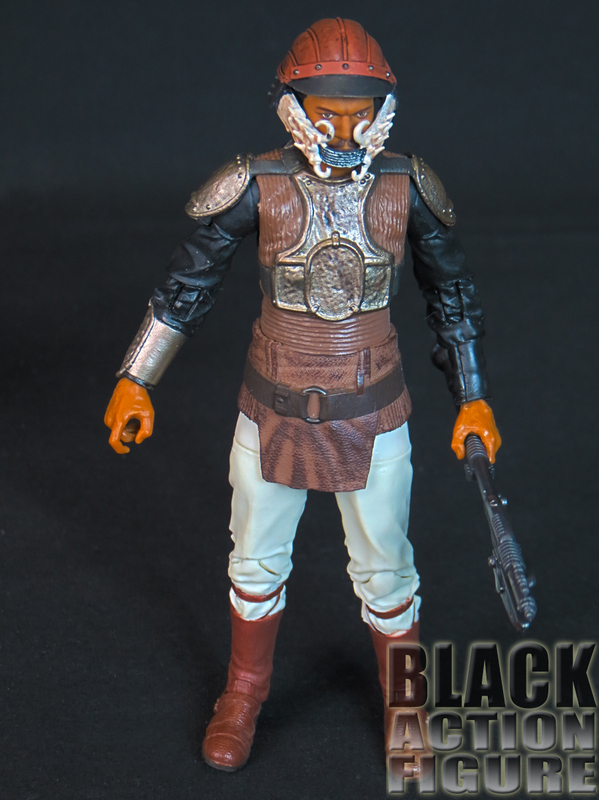 Some like the simplicity and collectibility of the Star Wars: The Black Series collectibles. I did at first, but now find it boring and a little redundant. 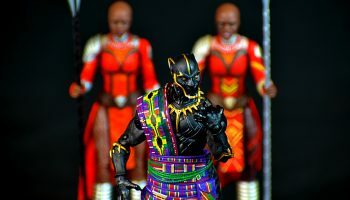 It’s been over five years since the first wave of figures, and not much has changed since then. Nothing more to tell over the normal. Functional window in the front displaying the figure and accessories. 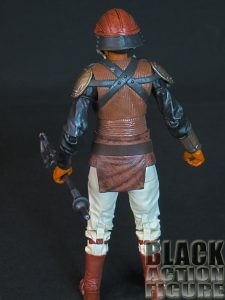 Along the bottom we have figure identification and character artwork. On the back we have the same artwork along with a bio-blurb of the character in 5 different languages. I do wish sometimes Hasbro included the figures that came in this particular wave. 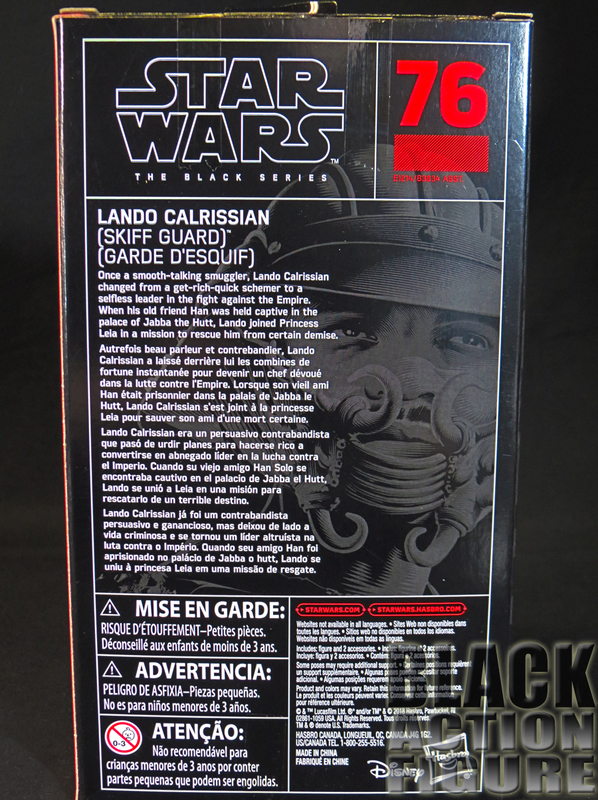 But with Star Wars figures, it’s a little different since figures can be released in more than one wave. Other than that, easy for collectors to open up and repack at their whim, and easy to display or store due to the friendly, stream-lined boxy shape. 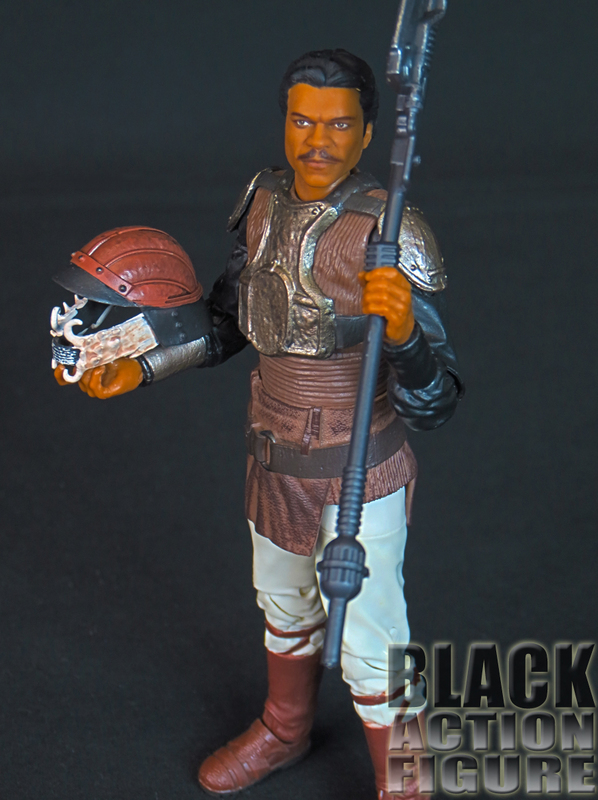 This figure comes with two absolutely necessary accessories including Lando’s disguise/helmet and his staff/axe weapon. I digress. The weapon is a good sculpt and fits well in his hands. The only other thing that I feel could have been included with this figure is a gun of some sort. 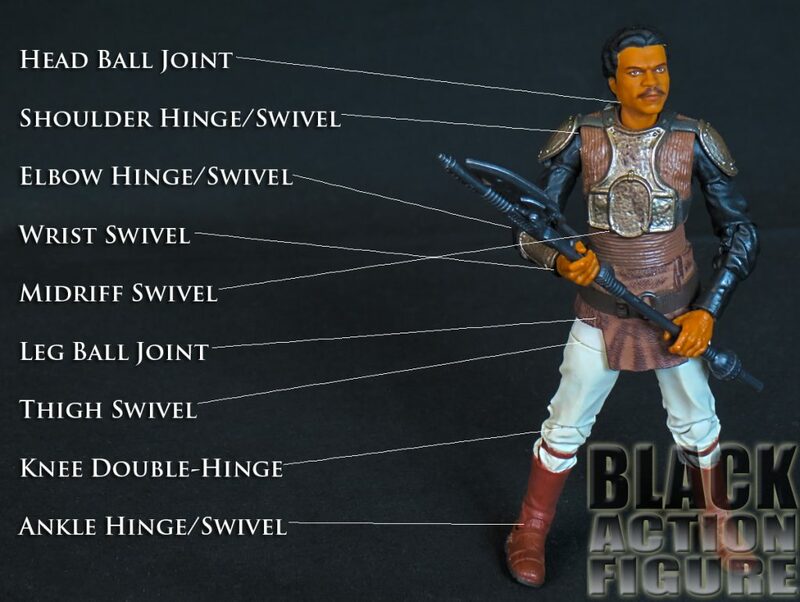 The figure’s right hand is sculpted for a weapon. Maybe one day Hasbro will make a weapons pack full of random weapons that can be distributed to various figures. 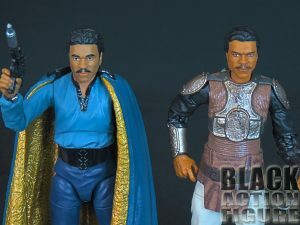 One year later, and this head sculpt IS Billy Dee Williams. I can’t believe how much Hasbro has improved their facial likeness for figures in the last year. 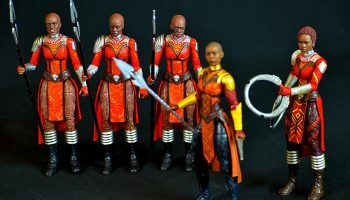 Just like other Hasbro figures, sometimes it took them a few tries, but eventually they would get it right and get it right they did. Zoom in on the picture to the right and just look at the two figures side-by-side. It doesn’t even look like the same company did them. There seems to be shadowing in the face with more details. The eyebrows and mustache even look more natural. I can’t express how much this is like night and day. 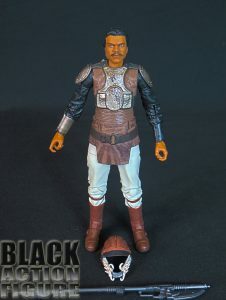 If anything, I will probably pick up a second figure to replace the head on my other Lando. Of course the outfit sculpt is on point and the paint job is good, although I did see specs of something on the arms. They are in the desert, so I’ll just pretend it’s sand. 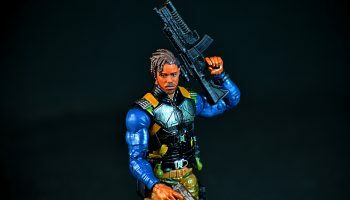 As impressed as I am with the sculpt and likeness of this figure, I was a little disappointed that this figure only has around 24+ points of articulation. Now 24+ POA is actually not that bad, but from Hasbro, I always expect them to go above and beyond and get the number closer to 30 if not more. It seems with their Star Wars Black Series line that Hasbro takes more time to hide joints more creatively than they do with their other lines like Marvel Legends. While this is good visually, it does hinder some poses. This figure is generally balanced well, but I did have some trouble with the feet in the beginning. Once I figure the center of gravity of the figure, it made posing a little easier. 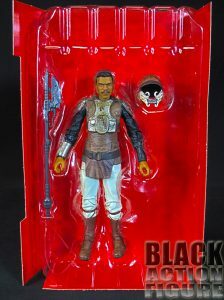 I just now had to go back and look at the figure. I only included a “Wrist Swivel” on the chart above, but it also has a hinge. However, the outfit sculpt prevents from the usage of the wrist hinge, so I still stand by my original assessment. 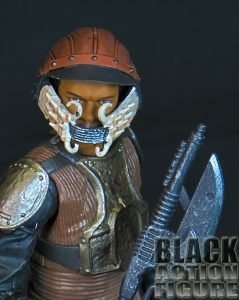 Awesome sculpted figure, okay articulation. 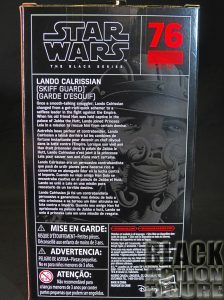 If you are a Star Wars fan at all, this figure is a definite must have. I think with Lando we generally get three different figures in each line: Bespin Lando, Skiff Guard disguise Lando, and then General Lando. 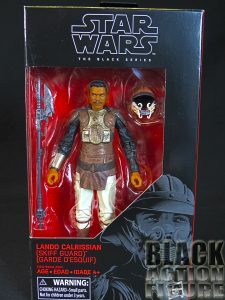 I think if Hasbro keeps with the same process or even reuses this particular head sculpt, they will blow us away with the General Lando figure.